When Alfred Morang was a teenager he took to the nightclubs of Boston with his trusty violin. He had been a sickly child, bedridden and unable to attend school, but his mother and uncle recognized his fiery creativity and hired private music and painting tutors. Morang grew from a talented tot to a full-fledged young Renaissance Man, and his passionate musical performances earned him enough money to thrive. It was the beginning of a lifelong artistic journey. A century later, Morang’s fiddle launched yet another adventure. Santa Fe art collector Paul Parker was researching Morang’s life when he came upon a letter by the artist’s longtime wife Dorothy. After Morang’s tragic death in a studio fire, Dorothy was having a hard time finding an heir to his worldly possessions. She’d finally contacted a distant relative, and was arranging the shipment of a few things collected from the ruins of Morang’s Canyon Road casita. The letter was Parker’s first clue in a treasure hunt that spanned the nation and stretched to the farthest branches of the Morang family tree. At the end of the trail was a treasure trove that connected the dots of Morang’s life, from his early years as a celebrated musician and writer to his time as an iconic Santa Fe artist. Morang’s well-worn violin, blackened by the fire, is perhaps Parker’s most striking find. It will appear alongside Morang’s artwork in our December 12-26 exhibition MORANG AND FRIENDS. How did you first get interested in Alfred Morang? I came to Santa Fe in the 1990’s, and met Jim Parsons in Taos not long after. He had a little booth with a rack of prints and drawings and things, and he had a pile of books called The Art Fever. We hit it off and just talked and talked, and I bought a copy of his book. I took it home and read it, and realized who I was talking to. There was a time when Jim Parsons was the most powerful person in the Western art business. Back in the day, he had a little art gallery in his Denver apartment. He convinced Philip Anschutz to start a Western art collection, which is now the largest and most prestigious collection of Western art in private hands in the world. Jim was a giant Morang fan, and he showed me his work. I became instantly fascinated with Morang’s story. I had seen his paintings in El Farol but didn’t know anything about him until Jim told me. Tell me about Morang’s childhood. He was born in a little town called Ellsworth, Maine. There’s still a Morang Chevrolet in Ellsworth that his father owned with another partner. He and his mother had a very close relationship. Even as a child, Morang was something of a polymath. Yes, he learned from Carrol S. Tyson and other American Impressionists. He was also the youngest-ever solo violinist to play at Jordan Hall in Boston. I mean, he was a very accomplished musician. His wife Dorothy was a member of the music conservancy in Boston. That’s where he met her. He and Dorothy lived in Portland, Maine before his tuberculosis forced them to move to Santa Fe in 1938. 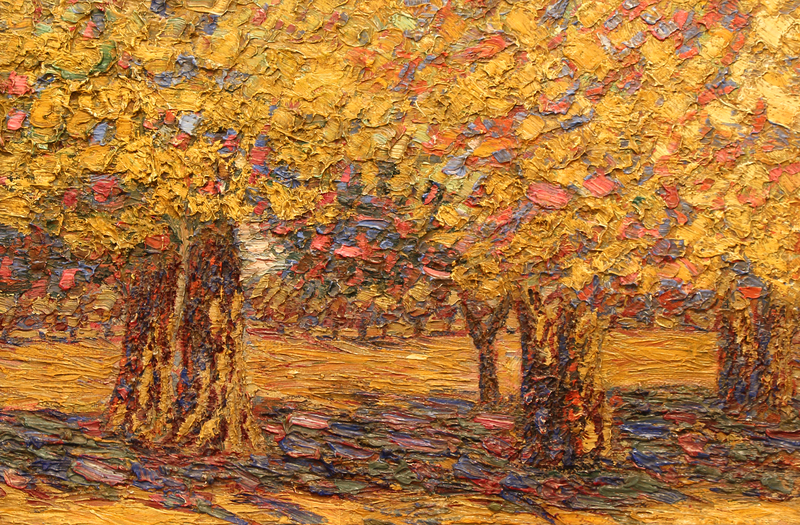 Morang had a successful a writing and painting career back East. What are your thoughts on his early work? I’ve seen some of his work from back then. 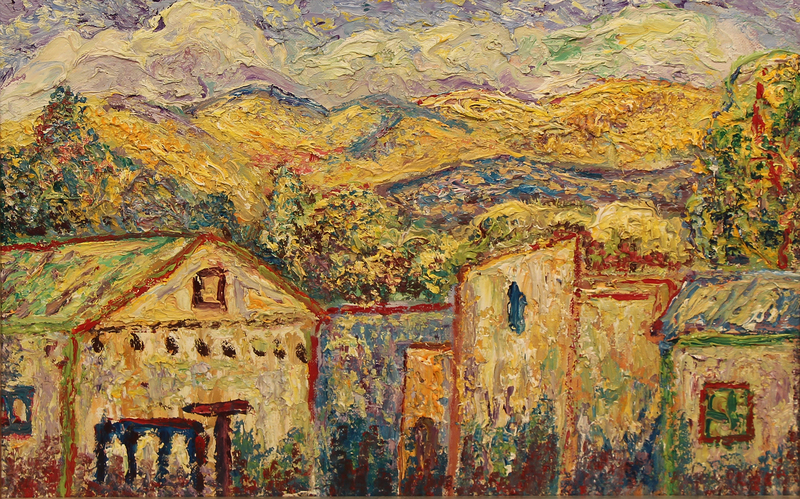 Like a lot of artists, when Morang came to New Mexico and saw the color and the light and everything, it inspired him. I think that’s the biggest thing. It’s almost akin to my life. I thought I enjoyed art, but until I moved to Santa Fe, until I drove by 100 galleries every night on my way home and everybody that I associated with and talked to was in the business in some way, shape or form, something about that was really inspiring. How did you start hunting for the box of Morang’s possessions? After I went to the library that day, I realized I needed more research, so I went to the New Mexico Museum of Art and searched their archives for anything I could find in Alfred Morang’s folder. That’s when I found Dorothy Morang’s folder, and saw her letter. It said that she had sent this box of Morang’s possessions away to Carrie Morang Robinson in Atlanta, Georgia. All I had was the name Carrie Morang Robinson and this address in Atlanta. I did my research and found out that she was deceased. I couldn’t find any relatives, and her former house had a different owner. That must have seemed like a dead-end. I did some more research and tried to find Alfred’s relatives. Carrie Morang Robinson was the daughter of one of Alfred Morang’s uncles because she was a cousin and had the family name. I found one uncle’s name through the Morang Chevy dealership in Ellsworth, but then I ran into another dead-end. A couple months later I got a Maine antiques publication, and there was something about ancestors in it. I got some other names of who Carrie Morang Robinson’s father might have been. I found some members of the Robinson family, and started researching them. You were making some headway! I just start calling people again, and this woman whose name was Robinson came up. I called her, and she said, “Oh, our cousin Alfred. Our mother used to tell us about him.” I started telling her a little bit of the story, and she said, “You have to talk to Gwen.” I just lit up, because Gwen was Carrie Morang Robinson’s granddaughter and lived with her grandmother in the final years of her life. Now Gwen owns Carrie’s house. I called Gwen up, and she had all of these family stories about Alfred, that he used to go through the woods with his violin and his cats following him. “Weird cousin Alfred” or something like that. She said, “Well, if my grandmother owned the box, it’s probably still up in the attic.” Then I got excited. You were one step away. It must have been tantalizing. How did it feel when Morang’s artifacts finally arrived at your door? It was absolutely phenomenal. It was like the biggest Christmas ever. To see that violin and just to touch it. Talk about personal. The box was full of many different short stories and manuscripts, which he submitted to radio stations to be read as radio plays. Many of these stories were never published, and might have been lost forever. Did this elaborate hunt make you wonder why someone didn’t try to keep the artifacts in Santa Fe? Dorothy and Alfred got divorced in 1950, but even then Dorothy kind of watched out for him. When he died, she knew about this cousin Carrie Morang Robinson, who was the only rightful heir to his possessions. Dorothy stepped up to help contact her, and at the time it wasn’t a big deal to send them away. Morang’s colorful personality often overshadows his artwork. Is that frustrating for you, as a big fan of his work ? It’s the same frustration that I have now with van Gogh. I know from all my research that van Gogh was not a crazy man. He had epileptic fits that affected his life and personality, but he was a very brilliant man and definitely not insane. It’s almost the same thing with Alfred. People like the story of a bohemian alcoholic, something that fits better with the story of Toulouse-Lautrec. He wasn’t an alcoholic. He couldn’t have done the things that he did if he were an alcoholic. The greatest quote that I’ve ever heard about an artist is from Morang’s memorial service. 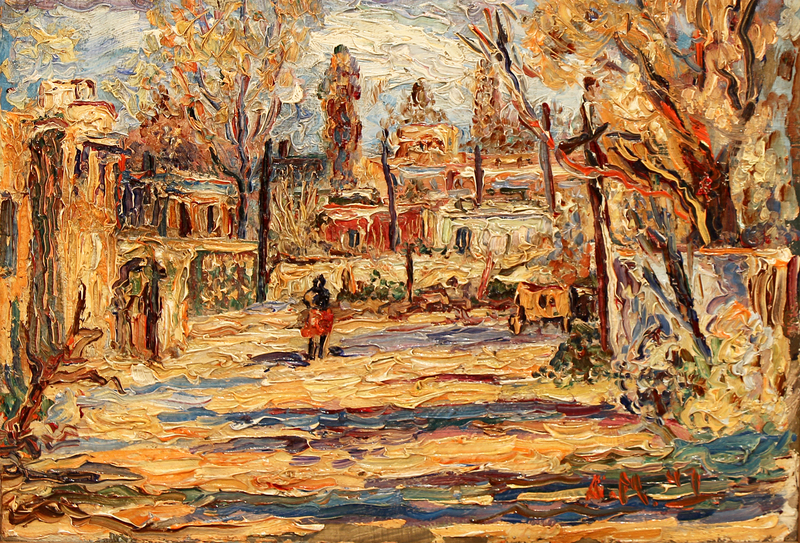 It’s not attributed to anybody specifically, but an unknown artist said, “It’s no wonder that we in Santa Fe mourn the loss of Alfred, he taught half of us how to paint and the other half how to see.” After Morang’s death, all of a sudden people started to realize that he was a great artist. People regretted that they didn’t pay enough attention to him. Coming up next week, Paul Parker digs up more mysteries of Alfred Morang’s life and travels to Paris to complete a mission in Morang’s memory. Make sure to connect with us on Facebook, Twitter and Instagram for daily updates on MORANG AND FRIENDS.